Posted 19 December 2010 in Bonus, Cooke Looks, Jimmy Olsen #136. This all is big, big stuff and we need time to process the implications, so it’s worth appreciating the nice balance of action and explication in this chapter of Jack’s big, big masterpiece. We sense the Kirby juggernaut of hyperkinetic storytelling is about to come barreling at us helter-skelter again, why with the story’s final page depicting Mokkari and Simyan observing one of the “Unknown’s” eggs cracking open and we see, thrusting from the shell, one arm, then two arms, then… four arms??!! Oy vey, time to buckle up the seatbelt again, partners, cuz there’s another Kirby-driven bumpy ride ahead! If I have any quibble with this issue, it’d be that Giant Jimmy is dispensed with rather quick-like and a tad neatly, encased as he is in a liquid nitrogen coating and plopped in Cryonic Capsule 31570, after the Scrapper-Trooper stealth attack — I guess the build-up had me hoping to see a more involved battle; but the coming “Four-Armed Terror” two-parter, culminating in the breathless, nail-biting suspense of the “Big Boom” and accompanying end-of-the-world (well, their world, for sure!) countdown to nuclear Armageddon… well, let’s just say the climax of Jimmy and the Newsboy Legion’s great adventure at The Project was worth getting to as soon as possible. Posted 17 December 2010 in Apokolips, Day Entries, Earth, Jimmy Olsen #136, Villains, Weapons & Devices. 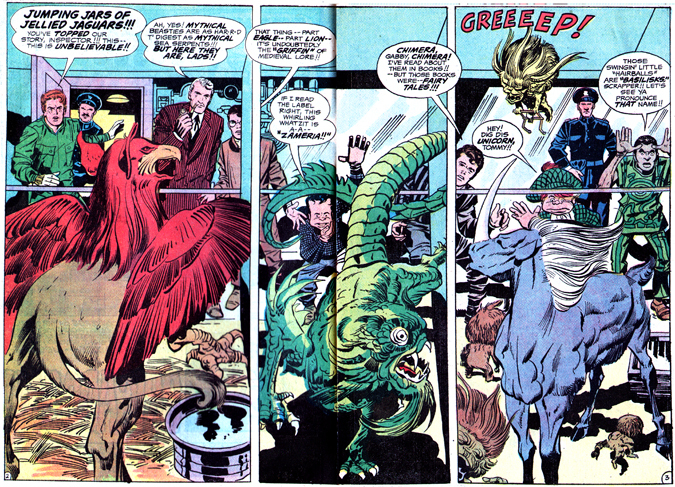 During Superman’s guided tour of The Project, the Man of Steel points out the three categories of clones being grown: Normals, Step-Ups and Aliens. 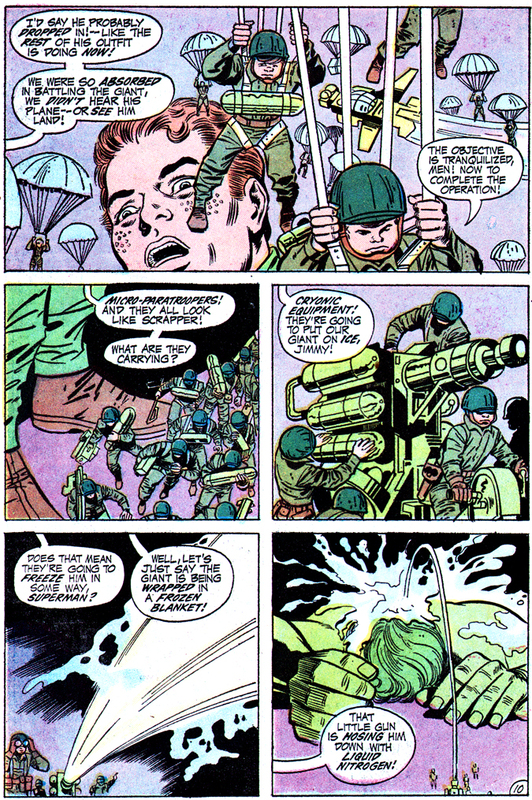 Normals, I guess it’s safe to assume, are the rank and file who work at The Project and have been reproduced from the DNA of living, “normal” people (i.e., regular folks of average intelligence and abilities), including the Jimmy Olsen guards at the Duplication Section and Communications Division Gabbys. It may also be proper to include in this category those in the “Miniature Replica Files,” such as the Scrapper-Troopers and the miniature Supermen, Jimmy Olsens and Newsboy Legion members (both those at The Project and grown at the Evil Factory from stolen cells). The Guardian likely fits with this grouping, as do the “beasts of burden” at the Evil Factory and Floyd “Bullets” Barstow’s clone. The first genetic structuring to run wild in the laboratory almost proved to be the last!!! When it quickly evolved to adolescence, The D.N.A. Project found trouble on its hands!! The battle with it lasted a day!! It was the first ‘D.N.Alien’ The Project had produced!! It grew fast! — And hostile! Nothing seemed to stop it!! Tranquilizing gas seemed to slow down its movement — but not the maturing process!! Somehow, its metabolism was wildly accelerating!! — Emitting great bursts of bright, searing, damaging energy!! The disruptive force affected thousands of circuits — and cut off communication between The Project and the outside world!! Great shocks followed!! And cracks appeared in places where subterranean waters broke through to cause critical emergencies! And on the Zoomway itself, large fissures opened and yawned! The low casualty rate was an incredible part of the strange events!!! Then in a last, terrifying burst of body energy, the alien caused an aurora effect that could be seen for miles!!! It proved to be the last of him! He had literally burned himself out!! — And with such devastating force that his powdery remains shocked witnesses into silence!!! The D.N.Alien, however, didn’t die in vain!!! His brief life left vital clues on how to keep succeeding D.N.Aliens alive!!! Dubbilex, as we found in the previous entry, serves as a researcher at The Project and is developing his latent telekinetic powers, aiding Superman in the Cosmic Carousel affair. The Four-Armed Terror, and his multitudinous brethren called Homo Usurpus, was bred by the Evil Factory from samples stolen from The Project. 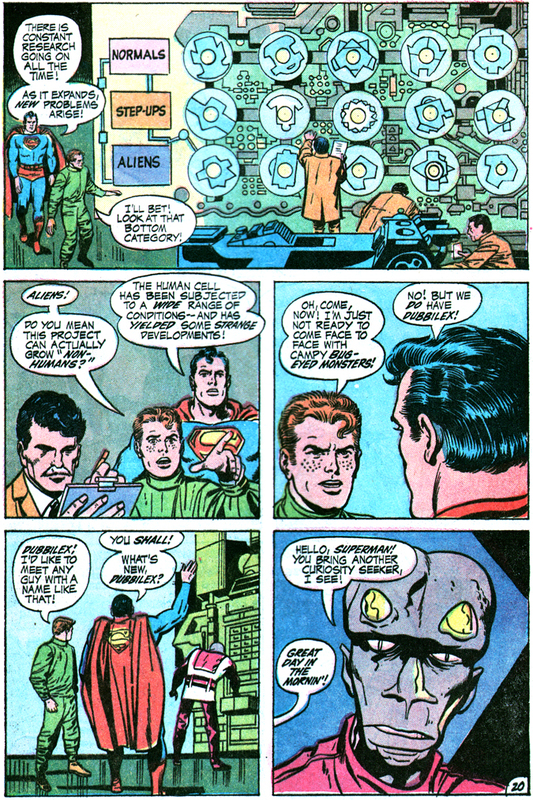 Superman says, “Among the living human cells [the Evil Factory] stole from The ‘Project’ was a special batch which had been treated in a manner to simulate Atomic War conditions! He could be bred for surviving Atomic War!” Whether these were mutated by Mokkari and Simyan with their Beta Gas is open to question, but the Terrors are apparently different than The Project’s prototypes as they actually consume radioactivity. Arin, the Armored Man, was developed for interplanetary travel without the need for life support or artificial environment as he can travel in deep space as if swimming. His singular mission is to go live on a distant asteroid and protect the contents of his back-pack: Superman’s cell tissue and genetic code. Simyan: With our superior equipment, we have rapidly established a project to rival their own! Now, from living cells we can produce what they do — human beings! Mokkari: Of course, we stole the first samples from the Earthmen — but now we can make our own! We shall breed them in all sizes — as small as we want them — and as large as their destinies demand! It is interesting that the closing “next issue” blurb in JO #135 is phrased as follows, illustrating the Guardian clone emerging from his Life Chamber: “Don’t miss his clash with the renegade replica! These are not ordinary humans in combat! This is a new breed spawned by a new concept! The DNAliens!” Is Jack telling us the Jim Harper relica is actually a D.N.Alien…? Mokkari: It is what we came here to do! To replace the Earthmen’s project — with ours! The Earthmen experiment for progress. But we work for Darkseid, ruler of Apokolips! Simyan: Our off-spring shall bring Apokolips to Earth! Chaos in place of order! And from that chaos will arise the new masters of Earth — with the great Darkseid as their exalted leader! Again, the primary purpose of the Evil Factory is to eliminate and replace The Project, as Simyan says while he and his partner overlook a scale model of The Project, “Yet, all this we must destroy! It shall become again as it once was — Empty! Silent!” Adds Mokkari, “We shall do it with the proper creations of the life we have bred here!” While they fail in “The Big Boom” to wipe out the government complex, they do The Project one better by introducing a new process to the game: Regressive Gene Induction. Mokkari: Regressive genes have proven a delight, haven’t they, Simyan!! Simyan: Yes, it’s been exciting to see each animal become its remote ancestral image!! 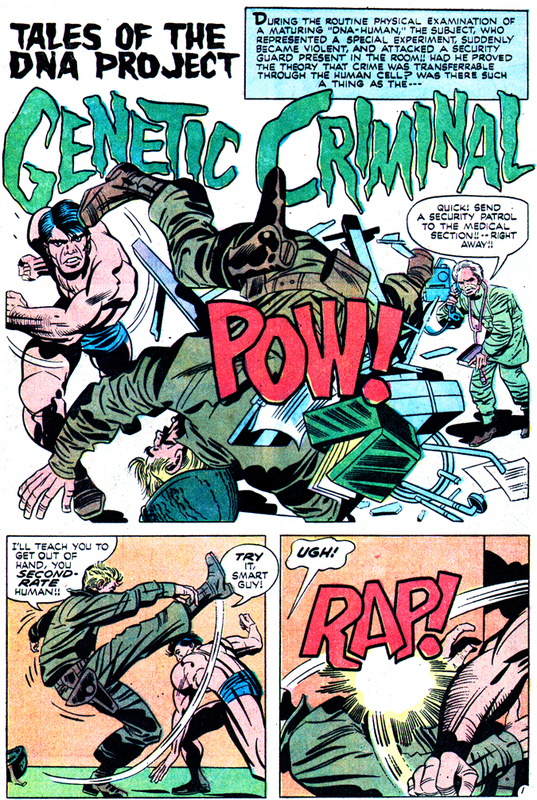 Mokkari: Millions of gene nuclei shot through his open pores!! Simyan: They develop like wildfire! Olsen will change rapidly!! Becoming what the gene dictates!! Sad to say — these are regressive and powerful!! 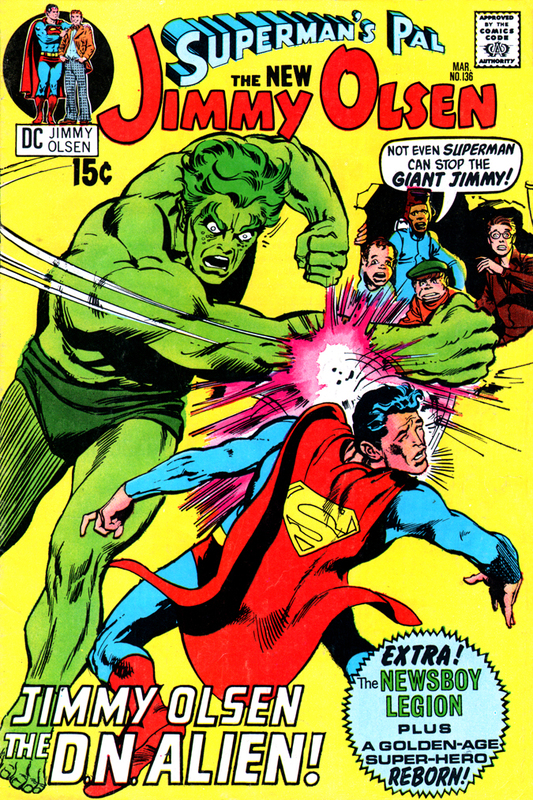 Back when he was a mere homo sapien, Jimmy wondered about the implications of all this genetic engineering, “Superman! Do you realize what weird, and perhaps dangerous, channels are being probed here?” You said it, chum. Day 76: The D.N.A. Project! Posted 15 December 2010 in Day Entries, Earth, Jimmy Olsen #136, Weapons & Devices. 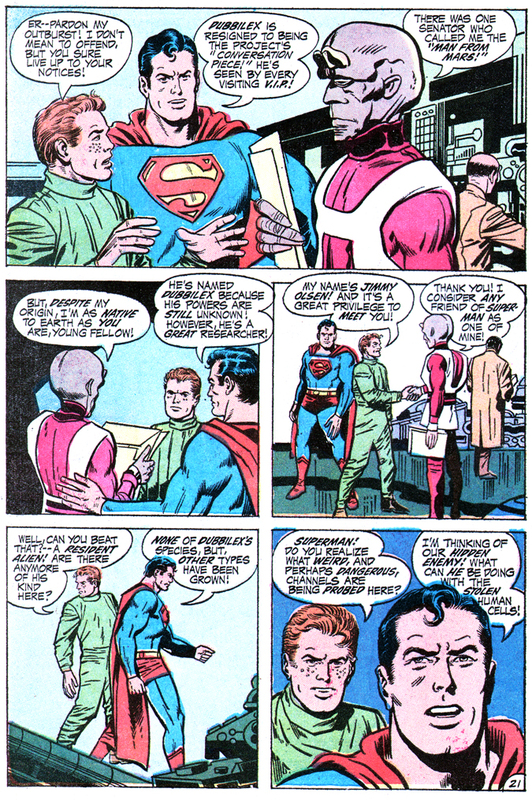 In the pages of Superman’s Pal, Jimmy Olsen, the role of The Project, that capacious subterranean high-tech complex staffed by military personnel, government scientists and some strange-looking folk, is exclusively assigned to the agency called the DNA Project. Now, whether the entire Project is devoted to cloning human beings — and other humanoids — is open to question. 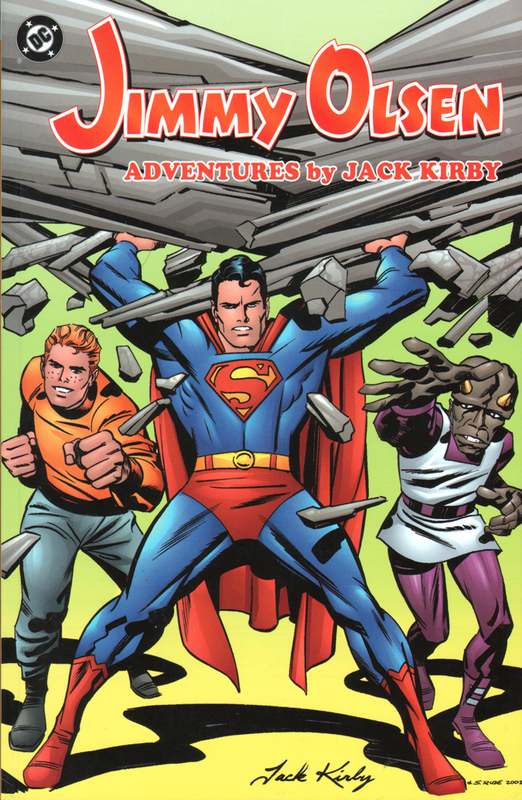 I say this because, as you can imagine, if the Fourth World had run its intended course, The Project had great potential to be a catch-all organization for all sorts of activity, thus rife with story possibilities. But, much as I’d love to extrapolate on what could have been, let’s focus on the fertile material actually presented in the published comic series, rich stuff indeed! 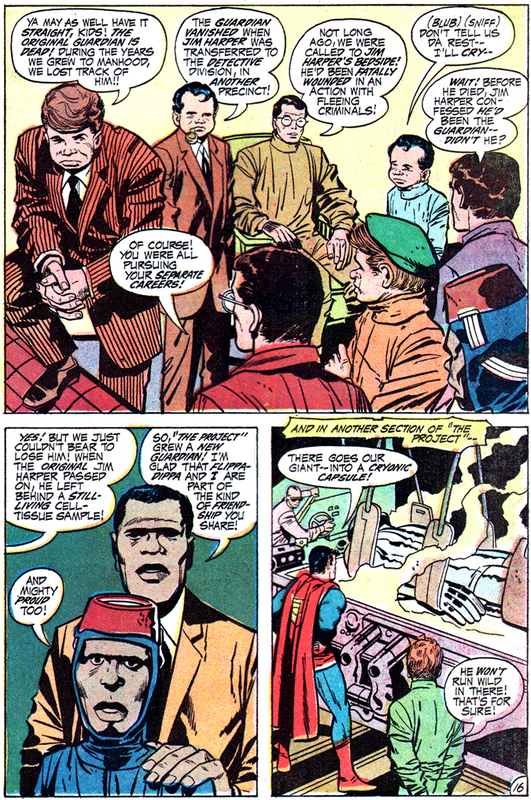 During this initial tour of The Project, Jimmy learns tissue samples were previously taken from himself and the Newsboy Legion (without consent) at the Daily Planet Dispensary. 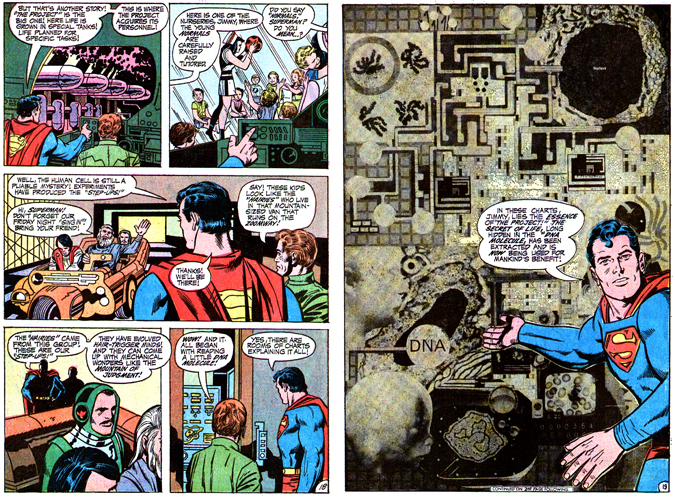 (Interestingly, Superman willingly donated his DNA to the effort; more on that soon…) Looking into a Magno-Microscope, Jimmy exclaims, “Good Lord!” as he views tiny versions of himself! In short time, he then learns “a good captain of detectives,” also deceased, has been cloned and is witness to Micro-Paratroopers, tiny duplicates also known as Scrapper-Troopers, parachuting all around him. Please allow a little question or two of the big developments going on… Just what in the name of Sam Hill is the government up to here? The U.S. of A. is surreptitiously stealing the D.N.A. of its unwitting citizens and harvesting clones to remain in (perpetual?) servitude of their vast underground complex? The clones are being gestated in giant tanks and then live in a subterranean world, rarely (if ever) seeing the light of day? And why no mention of the accelerated growth process these replicants are assuredly subject? Obviously, our encounters with the clones of the Guardian, Scrapper, Gabby and Jimmy all reveal relatively intelligent, level-headed humans… so what’s the secret of getting them so mature so fast? And the “Bullets” Barstow vignette: Scientists are growing humans to settle their nature versus nurture theories? What would have they done with Model Four if criminality was a genetic trait? Lordy, lordy, these questions boggle my wee mind!